Do you find yourself worrying whenever there is a big recession, not knowing when your investments will recover? This article will give you a better idea based on the past. Make no mistake – no one can predict the future. However, this article presents the past for a globally diversified stock portfolio (Long-Term Component by QAM). 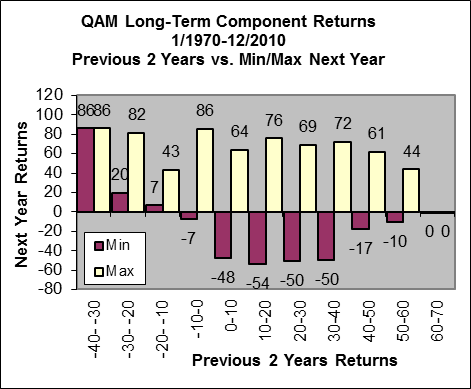 The following year’s minimal and maximal returns, presented in the right graphs. For example : In months when the past year returns were -40% to -30%, the average next year returns were 30%, as seen in the top graph. 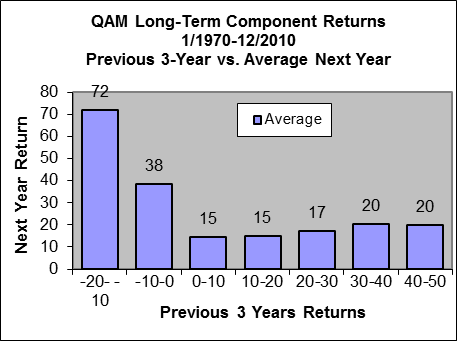 The minimal returns were 23% and the maximal returns were 38%, as seen in the graph right below it. 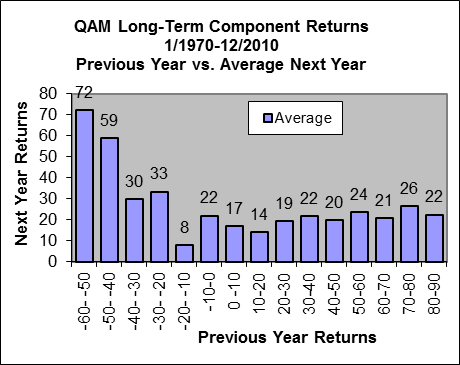 For all groups of past returns, the average next year return is positive. 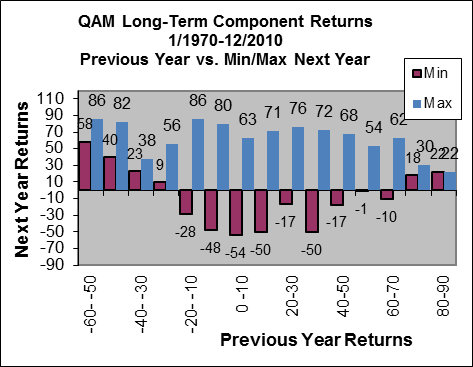 All next year returns following all worst declines in the portfolio were very high. Specifically, the following are the next year’s returns for each of the worst declines. All 1-year declines of 50%-60% were followed by 58%-86% in the next year. All 1-year declines of 40%-50% were followed by 40%-82% in the next year. All 1-year declines of 30%-40% were followed by 23%-38% in the next year. All 1-year declines of 20%-30% were followed by 9%-56% in the next year. All 2-year declines of 30%-40% were followed by 86% in the next year. All 2-year declines of 20%-30% were followed by 20%-82% in the next year. All 2-year declines of 10%-20% were followed by 7%-43% in the next year. All 3-year declines were followed by 7%-86% in the next year. 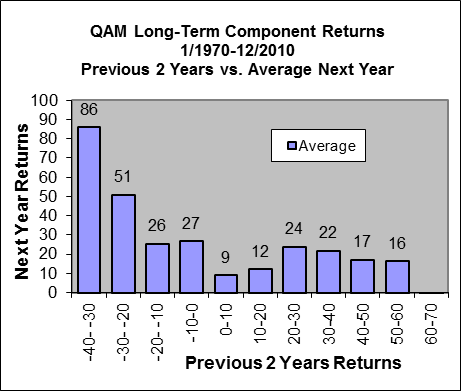 Following extremely high returns, the next year returns were usually positive and high. Specifically, the following are the next year’s returns for each of the best advances. After all 1-year advances of 80%-90%, the following year’s returns averaged 22%. After all 2-year advances of 50%-70%, the following year’s returns averaged 0%-16%, with most cases averaging 16%. After all 3-year advances of 40%-50%, the following year’s returns averaged 20%. For all past returns, the average next year return was positive. Nearly all 2- to 3-year declines of all magnitudes were followed by a recovery year. 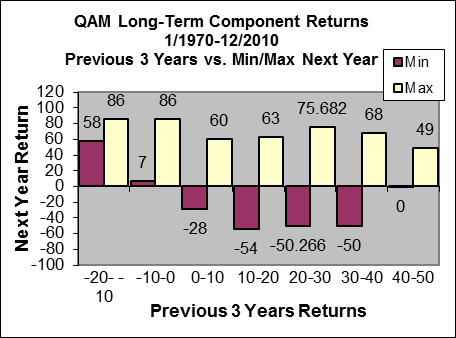 When past returns were the absolute worst, the next year return was always very high. The big surprise is that after the most extreme runs of growth, the next year return was still positive. Very high returns are not a precursor for a bad year. If history is any indicator of the future, this is great news! No matter how bad or good things were recently, you can statistically expect growth to continue in the next year. And when everyone is most depressed about an awful recession, you can make sure you are fully invested (with enough money for emergencies according to your long-term plan), and enjoy an unusually rapid growth. The results in this article cannot be used to predict the future returns of the portfolio. They just reveal relationships that existed since 1970, based on real and simulated data. Also note that the results above were measured using a stock strategy globally diversified into over 6,000 companies and having low costs across the board and no stock picking or market timing. Other strategies could lead to different results.